Several news outlets report the death of the choreographer Dame Gillian Lynne (of Cats, Phantom of the Opera, Chitty Chitty Bang Bang or The Secret Garden fame) who in 1995 devised, directed and choreographed (with Christopher Gable) The Brontës for the Northern Ballet Theatre. EDIT: Also in The Times. Very much a love letter to literature of Jane Austen and the Brontë sisters, so true to form our romantically named heroine is caught between the attentions of Glen Powell’s dashing American diplomat, and Michiel Huisman’s hunky book-loving farmer, called Darcy, sorry, Dawsey. Otras cuya imagen pasó a la posteridad en forma de cuadro pintado por un hermano son las hermanas Brontë. De Charlotte hay otro retrato que se difunde mucho y cuyo parecido con el cuadro de Branwell (el hermano pintor) es inexistente. No es ninguna sorpresa: según parece, sus dotes artísticas delante de un lienzo eran tirando a pobres. Not particularly poor? Well, it was not a slum, certainly. But the Parsonage (besides not being exactly theirs) cannot by any means be considered a rich man's house. We are not really sure that Mrs Fairfax fits that description, though. Noroeste (México) mentions Wuthering Heights. A Backward Story is giving away a signed copy of My Plain Jane. 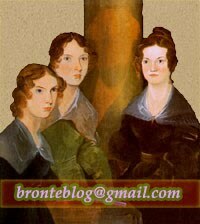 AnneBronte.org posts about Anne And Emily Brontë’s ‘Long Journey’.